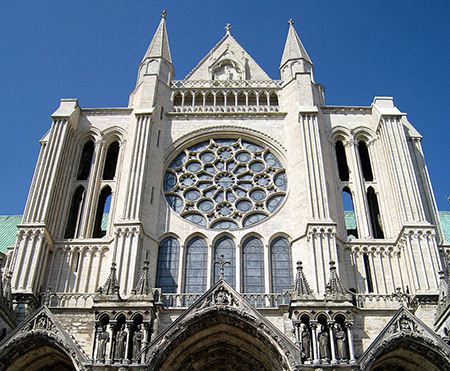 The men who built the cathedral of Our Lady of Chartres did not have diesel engines, or lightweight metals like soft aluminum or firm titanium, or steel girders. The men who built Europe’s greatest Gothic church did not have cranes that could tower a hundred feet in the air without toppling, while lifting pre-formed blocks of concrete. They did not have computer models. They did not have the calculus. Most of them assuredly could not read. They had to fit stones atop one another precisely to be both balanced and beautiful, and that meant that the stones had to be cleanly and accurately dressed, shaved with saws, cut to fit. Their carpenters had to know how to build safe scaffolding from the hewn trunks of hardwood trees, to soar ten or twelve stories in the air, supporting the men who, with sledges and pulleys and main strength, set in place the stones of lovely arches, springing on each side at exactly the same oblique angle from the pillars beneath, to intersect one another at a point clinched by the keystone. It is not enough to say that Chartres Cathedral is a great work of art. A sketch by Rembrandt is a great work of art. A single rib of a single pillar at Chartres is a great work of craftsmanship. A single panel of one of the lesser stained glass windows along the nave gives us art at its finest. Chartres is a magnificent symphony of countless works of sculpture, glazing, tiling, carpentry, masonry—and poetry and theology too. It is more than a museum or a collection. In a museum, one work is displayed next to another because it happens to have been created by the same person or in the same country or at around the same time. But every work in Chartres has to do with every other. I would say that there is nothing like it in the world, except that in fact there are things like it—all the other great cathedrals of the Middle Ages are like it, all over Europe; and thousands of churches, too, some of them the special churches for orders of priests, like Santa Maria Novella, the Dominican church in Florence, and some of them just the principal church for a small town or a village. At the Great Exposition, every entry boasted an inventor, but if you visit many an old church in Europe, you will see frescoes or sculptures created by “the Master of Anytown,” whose name no one knows. Drab is a favorite color in our day; its companion is garish. I defy any of my contemporaries to name one style of public building that is not now either drab or garish. Our churchmen have gone along with the movement, mostly drab, but sometimes garish, as witness the big childish banners blaring out a favorite comforting verse (never “It is a terrible thing to fall into the hands of the living God”), the glad-handing ceremonies of greeting and peace-wishing, and the priest more comfortable joshing with the attendees than praying with people who are, as he is, as we all are, on the inevitable journey to the grave and in dire need of the grace of God. When my daughter and I were in Sweden, we stopped in many a rural church built during the Middle Ages and then subjected to artistic reforms afterward. Sometimes I saw shadows that looked like water stains emerging through the plaster of the ceilings. I began to suspect that they were not stains or tricks of the light. When I asked a minister about them, he confirmed my suspicion. Many fresco paintings were whitewashed away in the so-called Enlightenment. It was that same Enlightenment, in its sanguinary French eruption, that smashed priceless stained glass windows in churches and cathedrals across the country. “Four fifths of [man’s] greatest art,” said Henry Adams, was created in those supposedly dark days, to the honor of Jesus and Mary. The Enlightenment destroyed more great art than it produced, and what the harbingers of the novus ordo saeclorum did not get around to destroying they slandered. There was, however, a generally healthy revival of Gothic art and architecture in the nineteenth century, thanks to the efforts of men like A. W. N. Pugin and John Ruskin. When Catholics immigrated to the United States from Italy, France, Germany, Ireland, and Portugal, they did not aim to build trapezoidal meeting houses with clear windows and no representations of the history of salvation. 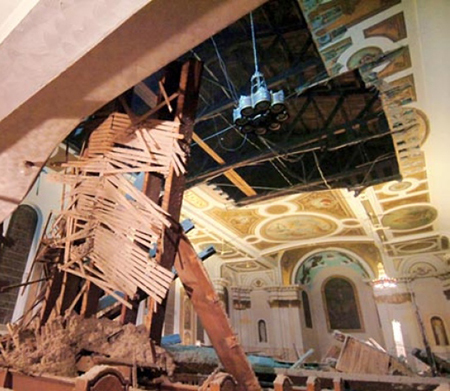 They aimed to build churches, and they achieved that aim. I have seen an inscription on the façade of a Portuguese church in New Bedford reading, in Latin, “The workmen of Saint Anthony’s built this to the glory of God.” I do not think that the inscription implied that they only paid for the construction. They did hire a master builder, but the men did the work—with their hands, their sweat, at risk of life and limb. And these were not rich industrialists but fishermen. In my home town in central Pennsylvania, the church-builders were Irish coal miners, and they built their Saint Thomas Aquinas Church in Romanesque style, pooling their funds to hire an Italian painter who had done some work on the rotunda of the Capitol in Washington. 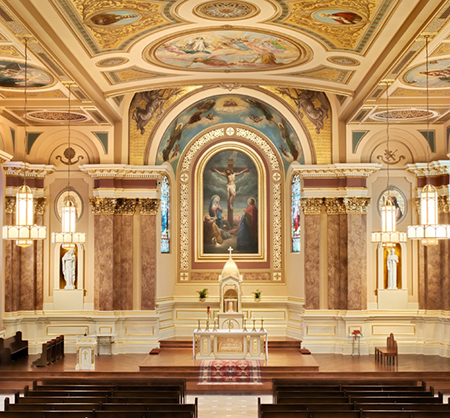 He came to lowly Archbald, Pennsylvania, and filled the church with paintings, nave and sanctuary, walls and ceiling. My boyhood church was beautiful. Then came the rage for the drab and the garish, and a good deal of that original beauty was obliterated, spoiled, or pulverized—at considerable expense. Drab, with garish its cousin, is our enemy. Does anyone go to visit the modern neighborhoods of Rome, built in drab? Does anyone take pictures of a new police station or a new post office? The most prominent features of the new county courthouse where we live are enormous glass “walls,” so that you can see into empty waiting rooms and hallways, and a sheltered area surmounted with a big metal fence and rolls of barbed wire. Our young people are not only starved for nature. They are starved for beauty. Everywhere they turn, their eyes fall upon what is drab or garish: their schools, the fast-food joint, a baseball stadium, and, of course, their churches. I have seen, in Catholic churches, minimalist Stations of the Cross that cannot even be recognized if you are more than a few feet away. The message they deliver is that the Stations are trivial. I have seen crosses that look as if a modernist Jesus were flying with wings outspread, like a theological pterodactyl. The message is that the Cross was a brief and unfortunate interlude. I have seen the Sacrament relegated to what looks like a broom closet. The message is that it is something to be embarrassed about and that we come to church not to serve God but to celebrate our own central goodness. I have seen one sculpture of the supper at Emmaus that has Jesus at one end of the table with the two disciples and two other figures ten or twelve feet away; it looks as if they are arguing with one another, perhaps dickering over the check for the meal. If you were not told that it was the supper at Emmaus, there is no way you could guess it. There is no message but chaos. I have seen a baptismal font with bubbles. The message is that flashy technology is to be preferred before silence. I have seen beautifully tiled floors, their intricate cruciform patterns bespeaking careful and devoted craftsmanship, covered over with a plush red carpet, wall to wall, such as might be used in a whorehouse down on its luck. The message is that we are the newly rich, with bad taste. It is long past time to get rid of everything ugly and stupid from our churches, most of it visited upon them since the great iconoclasm of the sixties. We must return to genuine art, art that stirs the imagination and pleases the eye, that entices the soul with beauty—even a dread beauty—before a single word of a sermon is uttered. “Where your treasure is,” says Jesus, “there will your heart lie also.” We can tell where a people’s heart lies by where they place their treasure. In material terms we are by far the wealthiest generation of people who have ever lived on earth. Yet our original accomplishments in all of the arts are meager at best. Renaissance painting and sculpture, music and poetry, are what you get when a vigorous popular and learned tradition that had already been immensely creative meets again the classics of Greece and Rome. Modern art is what you get when you repudiate the people, the tradition, and the classics. Individuals are left to trade upon the stock of their native creativity alone, which is not going to be great. Why would we care to make our churches beautiful when what goes on in them is slipshod and is not felt to be of even temporal consequence, let alone eternal? We do nothing in the week that is more significant than to serve God by prayer. That is a fact. We have forgotten it. Our hearts skip a beat when someone gives us a surprise ticket to the baseball game. Those same hearts plod along at their usual sluggish tempo when we dress for church. So we end up with stadiums that will not last twenty years before the owners of the ball club demand new ones. Chartres Cathedral has been standing for eight hundred years. Anthony Esolen is professor of classical literature at Thomas More College. His latest books are Real Music: A Guide to the Timeless Hymns of the Church and Out of the Ashes: Rebuilding American Culture. This article is adapted from chapter two of the second.